Photo courtesy of Lynn Casper. More than 1,000 bands have been featured since it began in 2011. Far removed from the high-profile celebrity gossip of Who Weekly or workout guru mystery of Missing Richard Simmons, Lynn Casper’s Homoground has been carving out a name for itself in the crowded podcast community since 2011. Billed with the tagline “Same Sound, Different Ground,” the queer music podcast has become a lighthouse for bands, events and organizations that fly under the radar of mainstream publications—a tactic that’s made it a formative incubator for queer talent. Casper, who was born in the Philippines and grew up in North Carolina, launched the first episode in January 2011 and, since then, the Brooklyn-based podcast become a fixture for queer musicians across the globe. More than 1,000 bands across the LGBTQIA spectrum have found a home on the Homoground’s airwaves and, as the show evolves, so too has its spread. Alongside the usual episodes, Casper has also begun to highlight music videos on the website and launched a TV show with BRIC TV. Now, as she envisions the platform becoming a “queer version of MTV,” she’s launched a Patreon to help keep the podcast running and, eventually, bring on more producers and hosts. We caught up with Casper between episodes to talk about the changing landscape of LGBTQIA rights, what queer means to her, and how music can break barriers. OUT: Since starting the podcast, what’s been the biggest change you’ve seen over the years? Lynn Casper: Podcasts have become a household name, whereas, when I started Homoground, it was an “internet radio show” and no one knew what a podcast was. I remember thinking the podcast would only last a handful of episodes before I ran out of music to play. Instead, I started getting emails from friends of friends and eventually strangers asking if I could feature them on the podcast—now I get submissions from musicians from all over the planet. The more music that gets featured on the podcast, the bigger the community gets since all the music is personally submitted by the people who make it and, since 2011, Homoground has featured around 1,000 bands with one or more members identifying with a letter of LGBTQIA. How has the show evolved alongside the public perception of the LGBTQIA community? I started the podcast because it was something I would’ve wanted to have access to as a teenager growing up in small town North Carolina who was thirsty to find artists who were singing about relatable experiences. I remember not feeling comfortable telling certain people or strangers about Homoground, thinking they would judge me or just not understand. There were a lot of folks who did have those reactions, but equally, there was a whole community of allies who were ready to speak out in support of equality. Now, there are so many media sites, podcasts and other outlets that cover LGBTQ issues [and] a lot more organizations and resources available—especially through the Internet. There are more people sharing their struggles and seeking out communities where they can be themselves. I think it’s in the nature of identifying as “queer” that when something you want [or] need doesn’t exist, you create it to make it easier for the next person. What does the term "queer" mean to you? For me, “queer” means breaking down boxes and labels that society puts on us. That applies not only to my sexuality, but also my gender, my identity in general, and many other things in my life. Being “queer” is an evolution in the human species. It’s a shift toward a higher level of consciousness. It’s not being one or the other, but all things all at once. Why is it important for you to highlight queer artistry in music? 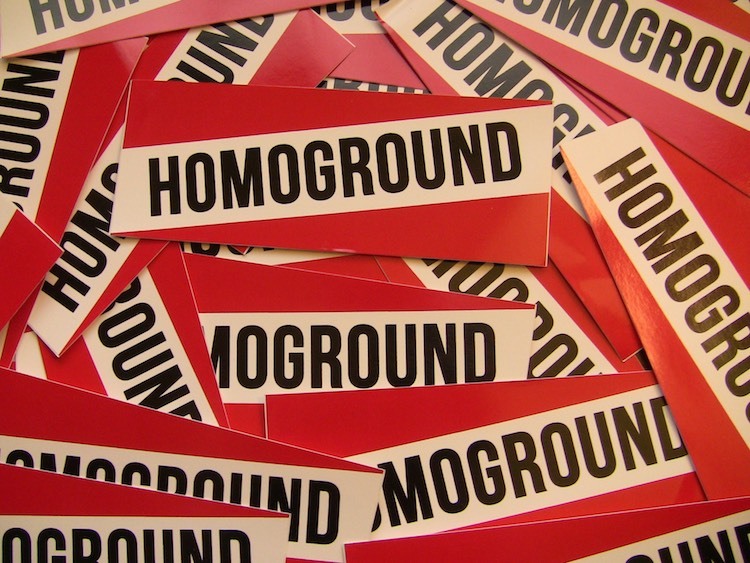 “Same Ground, Different Sound” is Homoground’s tagline. We all live on the same planet, but our experiences and the way we express ourselves are varied. I see the power music has on people when I go to concerts and festivals. A sea of people with so many different experiences and various backgrounds coming together to sing their favorite songs. Music has the power to break through so many barriers and connect people with each other. On the flip side, I want to celebrate the music and art my community is creating! There is so much of it and oftentimes, we aren’t afforded the resources of professional sounding recordings or record labels backing us. So much art is being created in the confines of bedrooms and low-fi recordings, [but] the quality doesn’t negate the passion. I want to share those creations with other people.